Wrog 4 America, originally uploaded by pamhule. 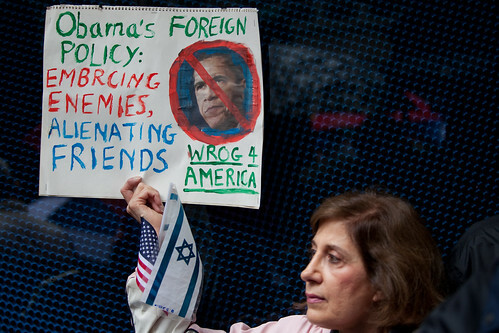 I happened upon a protest against Obama's Middle East policy in midtown on Sunday, April 25, 2010. 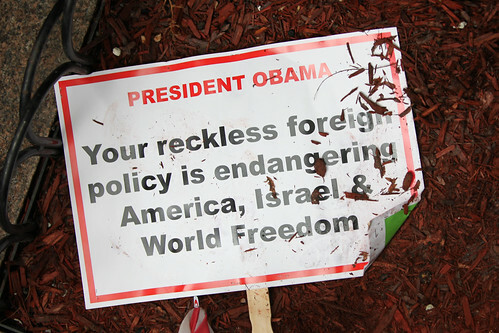 The protest was organized by the Jewish Action Alliance but attracted a variety groups, including Hindus, tea-partiers, and Christian evangelicals. I was struck by the extremism of many of the signs and decided to try to document the rally. It turned out to be an interesting challenge in photojournalism, and I would be interested in some feedback. For the most part I tried to take photos while the protesters were not paying attention to me but when that was too difficult, I would ask people to pose. 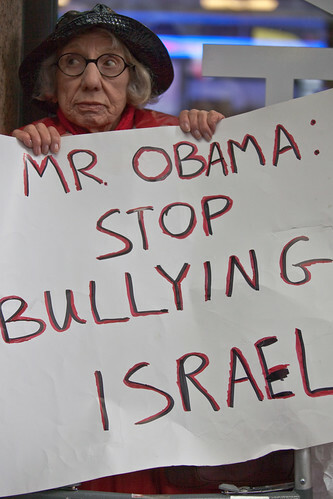 I have included a few more shots below along with a slideshow of the protest. For all the photos from the event see this set on flickr. Sign in the Dirt, originally uploaded by pamhule. Stop Bullying, originally uploaded by pamhule.